Above: Composite pipe fragment from Learnie 1B. Both caves have produced good economic evidence relating to their use during the post-medieval period, which once analysed, will provide some detail with regards to how the people lived and what they ate. One particularly interesting discovery this season was in Dead Horse Cave (Learnie 1B), where we uncovered a substantial deposit of fairly large fish scales. Smaller pockets of fish scales were recovered from Smelter’s Cave and Learnie 1A in 2017, with Jen Harland of UHI Orkney telling us that these are indeed rare finds on archaeological sites. The deposits of fish scales found this year in Dead Horse Cave had been trampled within the main part of the cave, but within the overhanging alcove on the south side of the cave the scales had survived well and comprised an intermittent layer up to 40mm thick. The absence of a sediment matrix within the fish scale deposit would indicate that the layer had formed relatively quickly and possibly as a one-off event. Although it can sometimes be difficult to identify the fish that the scales derive from, Jen at UHI has offered to submit a sample for isotopic analysis which can at least identify them to general species. Above: Close-up of fish scale deposits in Learnie 1B (see also our Youtube video). The big question surrounding the fish scale deposit is where are the bones from the fish? Although we have recovered some fish bones from the midden layers, especially from the more extensive shell midden excavated in Learnie 1A, their numbers appear to relate to the consumption of a small number of fish by the inhabitants. The deposit of fish scales appears to relate to a larger-scale activity, perhaps associated with de-scaling fish prior to smoking or brining. Could this activity be related to the curing of fish for their use by the inhabitants of the caves? or prior to selling into a wider marketplace? Hopefully, the analysis of the fish scales and any fish bones recovered from these archaeological layers will tell us more about the exploitation of marine fish, including salmonids, during the post-medieval period. The previous excavations in Dead Horse Cave (Learnie 1B) and Smelter’s Cave (Learnie 2B) had produced a significant number of hearths and spot-fires relating to their use during the post-medieval period, ephemeral stone dividing walls, cobbled surfaces and possible sleeping areas – the latter indicated by layers of decayed bracken and small branch wood. This year, we recovered additional evidence of structures within both caves under excavation. In Dead Horse Cave, the removal of a domed pile of small stone shatter located against the south wall revealed an underlying drystone-built structure. Comprising two walls running at right angles to the cave wall (extending around 2m into the cave), up to three courses high and approximately 1m wide. The height of the low walls became less as they extended into the cave and from our excavations it would appear that it formed a structure that provided some division of space, possible deflecting the wind and creating a small sheltered area within an otherwise open space – maybe for sleeping? It is possible that some organic superstructure was used to provide additional height to the screen, although from additional evidence for similar structures revealed in Learnie 1A, it seems more likely that the walls merely retained the small stone chips that were piled on top. Through time, the stone shatter had merely overrun the walls eventually hiding them from view. Interestingly, a second and slightly earlier dividing wall was uncovered just 0.5m further in to the cave, also abutting the south wall. This comprised a single skin feature, up to four courses high adjacent to the cave wall. Above: Drystone structure in Learnie 1B. A much more impressive suite of walls was uncovered however in Learnie 1A, also relating to the latest phase of activity during the post-medieval period. Within this cave, which is roughly aligned E-W another pile of small stone shatter was found extending from the north wall. Removal of this revealed a well-constructed double-skin wall with rubble core, up to three courses high, which extended south into the cave for around 1.6m, turned at an angle to the SE for 1.8m, then turned back to the NE for another 1.1m where it terminated. The wall guided access into the inner cave and chamber, blocked off the light entering the chamber, and deflected the wind. A second, smaller linear wall some 1.5m long blocked off a small recess in the west wall of the inner cave chamber. The wall, up to three courses high, was also hidden by a pile of small stone shatter and it appears likely that both of the walls in Learnie 1A revetted and supported the stone piles, creating a dark chamber within. At least two hearths, comprising roughly circular mounds of wood ash, were identified within the inner chamber. Above and Below: Stone wall in Learnie 1A at different stages of excavation. Below the post-medieval deposits in these two caves, the archaeological sequence is quite different. In Learnie 1A, it would seem that intermittent occupation was fairly continuous, extending back through the Medieval and Early Medieval periods. Much of the evidence for the Medieval activity comprises dumps of midden, which general takes place around the periphery of the cave walls and is demarcated by ephemeral rubble walls; and a series of well-laminated lenses through the centre of the cave indicating trampling and access by the passage of feet. This had resulted in quite compacted deposits running roughly through the centre of the cave into the inner chamber, with midden deposited to each side; that lying against the north wall in particular comprising loose marine shells and containing animal and fish bone. The lower part of the shell midden also produced several sherds of medieval ceramic including green-glazed redware (13th-15th centuries AD) and more importantly, Scottish White Gritty Ware (potentially 11th-12th centuries AD). Several hearths were associated with these periods of use, creating a complex sequence of ash lenses. At the base of the sequence in Learnie 1A, a substantial circular pile of wood ash and charcoal appears to represent a hearth relating to the Early Medieval use of the cave, along with associated shell midden deposits. These deposits overlay the natural sand in the base of the cave, outcrops of bedrock and some larger stone clasts, while large slabs of rock above derive from a major failure of the cave roof just inside the entrance. Our final major discovery was associated with the earliest use of the cave, most likely during the Early Medieval period. Within a hollow formed by bedrock and large stone clasts, a black, charcoal-rich, oval-shaped deposit was revealed and a closer inspection revealed small fragments of hammer-scale. We decided to run a section through the deposit and these soon revealed vitrified fragments of a smithing hearth and further hammer-scale. Careful excavation revealed a heavily burnt stone slab, to which was attached a well-preserved section of a smithing hearth, complete with vitrified ceramic wall and underlying hearth base. 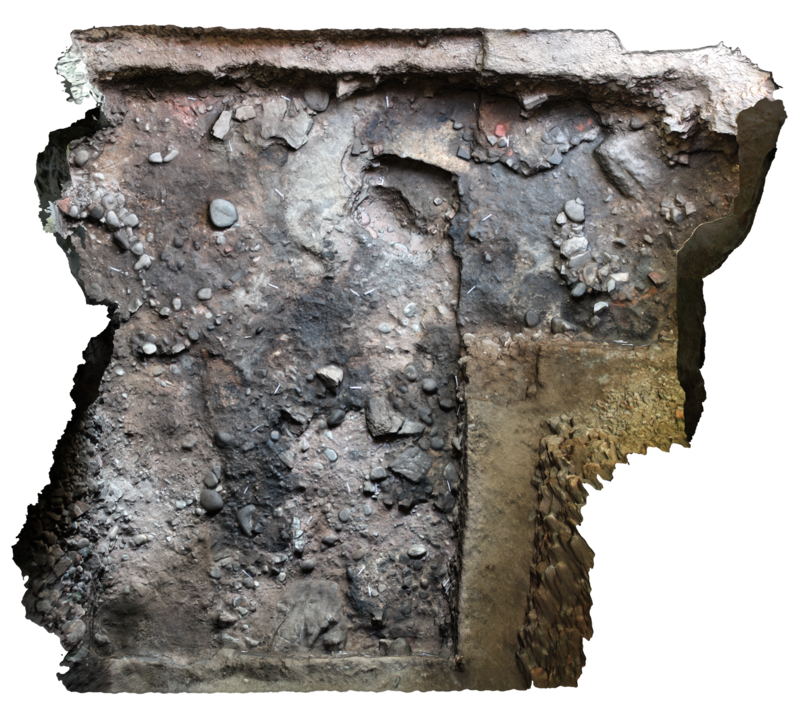 The feature was extensively sampled and photographed, and the feature was eventually removed in a block to enable excavation in more controlled condition. Damage noticed on one of the larger stones, or bedrock outcrops flanking the hearth, suggests is may have been used as an anvil. Such well-preserved smithing hearths from the Early Medieval period are incredibly rare and will add to a growing corpus of information relating to metalworking in caves through the prehistoric and historic periods. Above: Excavation of the smithing hearth in Learnie 1A. As mentioned above, the sequence of deposits in Dead Horse Cave (Learnie 1B) was quite different to that observed in Learnie 1A. Here, the layers representing the post-medieval activity lay directly on top of a deep spread of stone comprising shattered fragments from the cave walls and roof, and beach cobbles of differing size. During the 2017 excavations, this deposit of stone (which contains many air-filled voids and little sediment matrix) produced the largest assemblage of faunal remains from the cave sequence. This included some larger bone elements and an articulated fragment from the lower spine/tail of a fairly large ungulate. The excavations this year produced yet more well-preserved animal bone including articulated vertebrae, scapula, mandibles and mandible fragments. However, the most impressive remains included the complete skull of a horse, complete with articulated vertebral column. No ribs or limbs were attached to these elements, although we did recover individual ribs and limb bones that may have derived from it. Upon lifting the skull of the horse, the cause of death soon became apparent…..a circular hole around 20-25mm diameter was noted in the top of the skull, just back from the eye sockets! The horse had been poleaxed – a method used for killing horses up to the present day. A quick search on-line for comparanda revealed that the poleaxe blow to the skull did not usually kill the unfortunate animal…it merely stunned it and this would be quickly followed by the cutting of the throat to bleed the animal. Other levels of cruelty included poking a stick into the hole after the blow had been delivered, mixing around the contents of the cranial vault to bring about the animals final demise. This barbaric method of despatching horses is banned in most countries today. However, the poleaxe was not a weapon designed solely for the killing of horses…..this was a formidable weapon, designed to disable knights in full armour, and usually used by knights and men-at-arms fighting on foot during the medieval period. Above: The horse skull and articulated spine in situ, Learnie 1B (see also 3D model). The stone deposit, which extended across the excavated area in Dead Horse Cave, comprised a significant effort in time and labour especially if this was laid down to merely form a new floor horizon. Removal of the stones forming the base of this deposit revealed the Early Medieval occupation deposits, although it is possible that the upper part of this complex, but shallow sequence of layers, may relate to Medieval activity in the cave….in the 2017 excavations, at least two ceramic sherds may have been medieval in date. The floor deposits comprised lenses of wood ash, charcoal-rich deposits, midden, deposits with high organic content (potential bedding), and slabs of stone burnt a vivid red. The deposits forming this kaleidoscope of differing colours and textures derived from a sequence of hearths and fire-spots within the cave, some of which were domestic cooking hearths (as evidenced by the recovery of burnt and heavily calcined animal bone and some fire-cracked stone) and hearths with a potentially more industrious function. And, while no in-situ smithing hearth was revealed during the excavations in Dead Horse Cave, we did recover all of the components that would support this activity including slag, fragments of vitrified hearth wall, heart base fragments and hammer-scale. Sampling of the floor of the cave using a one metre grid will hopefully have established the location of the smithing hearth, along with the use of a strong magnet to recover metalworking residues at the time of the excavation. From the use of the magnet, it would appear that the main focus of the hammer-scale and other metalworking residues is in the south side of the cave, just in from the entrance. Above:Hearth in Learnie 1B containing significant amounts of burnt and calcined bone. Above: Trench section in Learnie 1B showing extensive stone deposit above the early medieval horizon. The main area of the cave comprised quite level, trampled deposits, although low overhangs and areas with alcoves and rock projections formed the main focus of midden deposition – especially shellfish – which is also paralleled in Learnie 1A. Some fish bone and animal bone was also recovered from these deposits, although on a small scale when compared to the extensive stone deposits mentioned above. Artefacts, as with most of the Rosemarkie Caves holding Early Medieval deposits, are indeed rare finds! With the exception of a knife sharpening stone, two possible coarse cobble tools (hammers/pounders) and a couple of iron objects, the only other small find was a small, conical-shaped piece of antler which may be a small stopper or gaming piece. Above: Knife sharpening stone from Learnie 1B. Above: Piece of shaped antler from Learnie 1B - possible gaming piece or stopper. Removal of the lowest occupation deposits in Dead Horse Cave however, revealed some wonderfully-preserved evidence for the division and use of space. A roughly circular hearth towards the back of the cave produced burnt animal bone and most likely formed a domestic cooking area. A sequence of post and stake-holes, and post-settings, formed a roughly rectangular area – the long sides roughly mirroring the undulating cave walls; while the connecting back screen also appears to block off the rear, darker area of the cave. It is possible that a similar arrangement of posts also formed a screen closing off the front of the structure and the outside world, although this could not be confirmed due to the deep overburden forming a talus at the cave entrance. It is possible that the interior of this structure formed a major activity area in the cave, while the alcoves formed between the cave walls and the structure could have been utilised for other activities including sleeping and metalworking. A trampled walkway overlying the natural sand leads from the back of the screen structure at an angle into the back of the cave, where further evidence of burning was recovered. It is indeed remarkable to find such division of space within natural caves, although we did recover similar evidence in Smelter’s Cave (Learnie 2B) in 2016. Above: Mid-ex view of upper levels of the early medieval horizon, Learnie 1B from 3d model. The full model can be seen here. 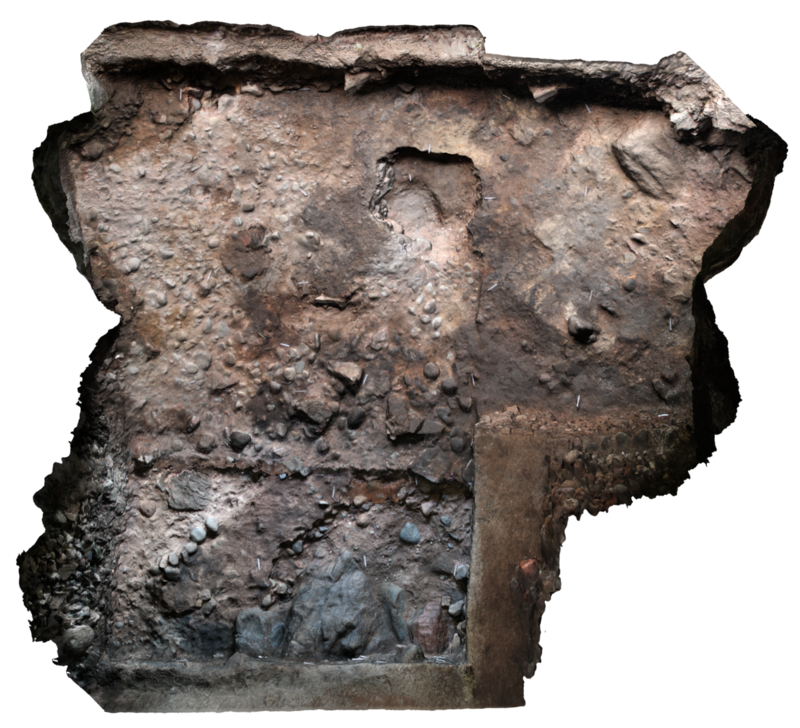 Above: Further mid-ex view at a deeper level within the early medieval deposits from 3d model. The full model can be seen here. Above: The basal deposits in Learnie 1B showing a number of post and stake holes from 3d model. The full model can be seen here. So, what can we say about our three seasons of open-area excavations in the Learnie group of caves? Results from the excavations in Smelter’s Cave (Learnie 2B), Dead Horse Cave (Learnie 1B) and Learnie 1A have indicated that the caves contain a wealth of material from the post-medieval periods of activity. The activity represented by these periods of use has, in particular, provided an interesting glimpse into the 19th and early 20th century lives of the occupants of the Learnie caves. The artefacts and ecofacts represent everyday activities and debris left behind by potentially itinerant inhabitants – who may have been using the caves on an almost permanent basis. This period seems to be associated with small scale industry represented by the shoe and leather finds, worked horn, iron scraps, other small finds such as the knives and cobble and bone tools; and of course, the large dumps of fish scales representing the processing of fish. Further specialist analysis on these individual elements (leather, iron and horn) together with the everyday items and midden material will assist in building this story. Further documentary research may also enhance our story for this period of use, as revealed by some initial results on archival material which has found references from a man living at a cave at Learnie regarding the burial of his wife (R. Jones pers comm 2017). Above: Shoe in situ, Learnie 1B (2017). The ethnography and ethnohistory of Scotland are rich in records of cave use spanning the late medieval and post-medieval periods including accounts by the famous travellers such as Martin Martin and Thomas Pennant and records from official government papers such as the Statistical Accounts and the Census Returns. Cave dwelling in Scotland, as in other parts of the UK, came to a fairly abrupt end in 1915, under the Defence of the Realm Act, when cave dwelling was strictly prohibited – possibly due to fires in coastal caves attracting the attention of enemy submarines. Before this time, many caves appear to have been used on a regular, but intermittent basis by some travelling people, possibly confining their movements to traditional, or ancestral, areas within which caves and rockshelters were known and used. Caves appeared to have been used for temporary residence and storage, and while residence is the most common use, it is obvious that many travellers were also itinerant craftsmen – essentially tinsmiths and basket-makers – and so were used as workshops as well as homes. Ethno historians have commented on the level of spatial organization within these caves including rudimentary furnishings, hearths, bedding, screens and windbreaks; the latter including ‘low stone walls’. The evidence we have recovered for the earlier periods of activity, in particular the medieval period, are more difficult to define. A lack of artefacts suggests that people either carried the tools and other equipment away with them from the caves for use elsewhere; or that cave function was based around very basic subsistence activities, storage, or as fugitive hideaways! And while the lack of artefactual material continues into the Early Medieval period, we have at least found good evidence for metalworking on a small scale in all three of the investigated Learnie Caves. And although we still await radiocarbon dates to confirm the date of metalworking activity in Dead Horse Cave and Learnie 1A, as with Smelter’s Cave (Learnie 2B), the metalworking was the first major activity to take place in all three caves (with the exception of the deposition of Rosemarkie Man). What is interesting with all three caves during this period is that after the metalworking ceased, temporary occupation continued – although it is difficult to tie-down function to anything other than general subsistence. Above: The smithing furnace with slag run, Learnie 1A. Did these caves function as craft workshops during the Early Medieval period, with connections to the emerging power centre at Rosemarkie? An important ecclesiastical site was eventually established in Rosemarkie and could have provided a central authority to control and direct elite skills and industries such as metal-working. Martin Carver’s excavations at Portmahomack have provided substantial evidence to suggest that these power centres were also the venues for major industrial and craft activities. Or, were the caves being used by travelling itinerant craftsmen, in much the same way as during the post-medieval period? Whatever the case may be, caves are liminal and dark places and there is a growing awareness that these ‘special’ natural locations in the landscape were selected for a whole range of activities in the past including craft working and metalworking. Metalworking in particular was viewed as a powerful and magical process – one befitting an unusual venue that served to highlight specialised and elite skills. Connections between metalworking and burial practices (in our case the execution and deposition of Rosemarkie Man in Smelter’s Cave (Learnie 2B) have been identified at other late prehistoric sites in Scotland, such as the burial of a woman placed below the slabbed floor of a metal and craft-working structure at Mine Howe in Orkney. Many of the earliest burials recorded on monastic sites such as Whithorn, the Isle of May, Portmahomack, Govan, and St Andrews Kirkhill have also been linked with craft working and industrial activity - especially metalworking. Some of their burials were inserted into craft-working areas at these important centres. The discovery of such a complete skeleton from the Early Medieval period is rare, especially beyond burial complexes such as those recorded at nearby Portmahomack and Balintore. This man’s death, whether brutal murder or a selfless act of sacrifice for the good of the local community, provides the potential to investigate a narrative associated with Late Iron Age and Pictish cultural traditions, and the arrival of Christianity. Laid out in a supine posture in Smelter’s Cave, the arms were by the side and the lower limbs had been crossed to form a “butterfly” shape with the knees splayed and raised upward. A heavy beach cobble about 0.45m long and 27kgs in weight had been placed over the lower limbs, and smaller cobbles placed over the right hand/forearm and upper left femur. This was a deliberate burial procedure – which is often classified as ‘deviant’. Perhaps the body was weighted down as an attempt to render a corpse safe, to prevent the spirit from returning to seek vengeance against the living. This is the treatment of a body that was different from the norm – whether for good or bad. Above: Rosemarkie Man in situ, Learnie 2B (2016). And, it perhaps should be no surprise that we have since found what can only be described as some quite unusual animal deposits, both in Smelter’s Cave and Dead Horse Cave. The surprise discovery of the juvenile calf burial in the back of Smelter’s Cave, overlying the natural sand and bedrock, below later midden and hearth layers, caused speculation for the archaeologists. An unusual burial of a young cow, showing minimal butchery and deliberate placement below a stone setting, appeared to display similar characteristics to the unusual burial of Rosemarkie Man, who was also placed on the natural sand/bedrock and had associated with him the butchered bones of the main meat-bearing limbs from at least eight cows and the scapula and tibia from a horse – possibly the remains of a feast to mark the death of the individual. The remains of the articulated juvenile cow were found just 1.5 metres away from the pit containing Rosemarkie Man. And during this year’s excavations in Dead Horse Cave, we have recovered the horse skull and articulated vertebral column, along with other semi-articulated and disarticulated animal remains – most of which appear to be from horse and cattle. The additional evidence for the poleaxing of the horse is also intriguing considering the trauma inflicted on Rosemarkie Man! Above: View of horse cranium showing pole axe puncture, Learnie 1B. The archaeological evidence based on the stratigraphy alone in Dead Horse Cave is not conclusive regarding the date when these animal remains were interred in the cave. The majority of the well-preserved animal bone was recovered from the significant stone infill placed in the cave, which we initially thought may have formed some type of levelling deposit – placed at the end of the Early Medieval activities, within the subsequent Medieval period, or even before activities resumed in the cave during the Post-Medieval period. However, the Early Medieval floor horizon onto which this raft of stone had been deposited was already quite level, so why go to the effort of moving this large amount of stone into position? In many ways, significant deposits of material such as this, especially containing increased numbers of artefacts or well-preserved or unusual animal bone deposits (as in this case), hark back to activities that are being increasingly recognised on prehistoric sites including High Pasture Cave, Skye, or at Howe in Orkney. At these sites, the deposits appear to form ‘closing’ deposits, marking significant events or a moment in time in the sites history. In the case of Dead Horse Cave, did this significant stone deposit and the animal bone it contained, mark the closure of the Early Medieval occupation horizon in the cave? We intend to submit samples of the horse and other bone material from Dead Horse Cave for radiocarbon dating, along with a sample from the juvenile cow in Smelter’s Cave. Only with these results will we be able to determine if these unusual depositional events in the caves were contemporary, or if these events formed a part of continuing ritualistic practices well into the historic period. So, we will now have to await with some interest the results of what will be an extensive post-excavation programme. It is these results which will hopefully put more flesh on the bones of a story that is starting to take shape, providing what should be a rich data-set that will elucidate the complex pattern of cave use at the Rosemarkie Caves. Above: American visitors from the nearby excavation at Castle Craig getting a guided tour. Above: Some of the team in Learnie 1B. Above: An appropriate presentation to the excavation director from the team in Dead Horse Cave. 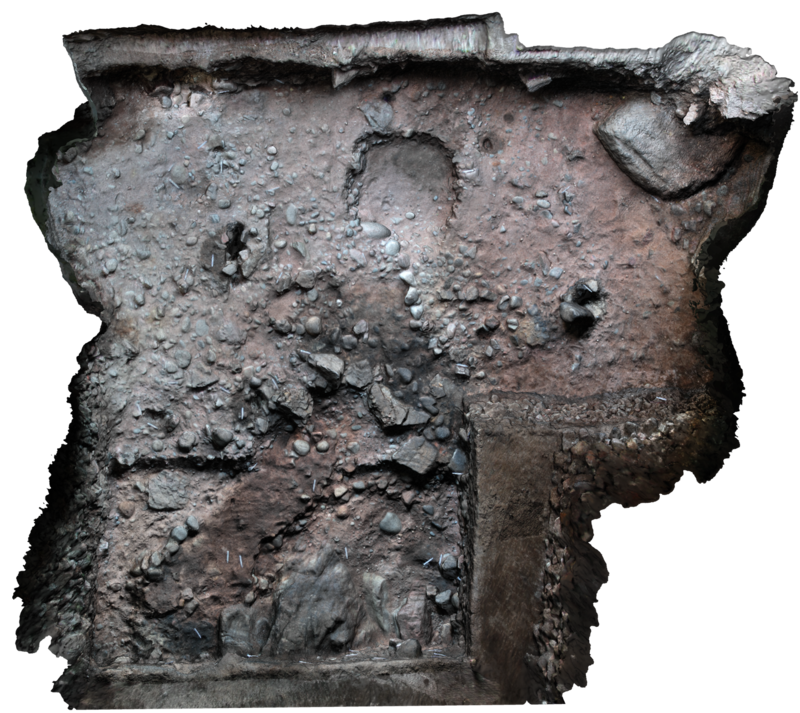 Further videos and 3d Models can be found on the 2018 Excavation page.